On Sunday 14 April, Red Beach Surf Club will pay tribute to Bryan & Pat Heron, affectionately known as The Flying Herons, at a special function in the clubrooms to honour 40 years of Heron sponsorship. In attendance will be club members, past and present, who have rowed in a Heron surf boat, paddled in a Heron surf canoe or have had a connection with the Herons during the past 40 years of this incredible sponsorship. It’s a partnership that the surf club is immensely proud of. 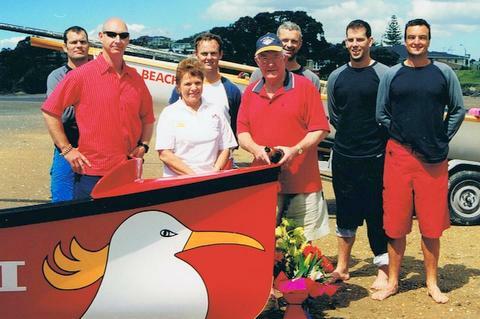 “I don’t know of another surf lifesaving club in New Zealand that can claim the continuous support of a single sponsor over this period of time,” said Red Beach executive officer Ross Malyon. Pictured above ... the launch of the very first Heron-sponsored surf boat in October 1988. A double ski was also sponsored by Heron Plumbing. 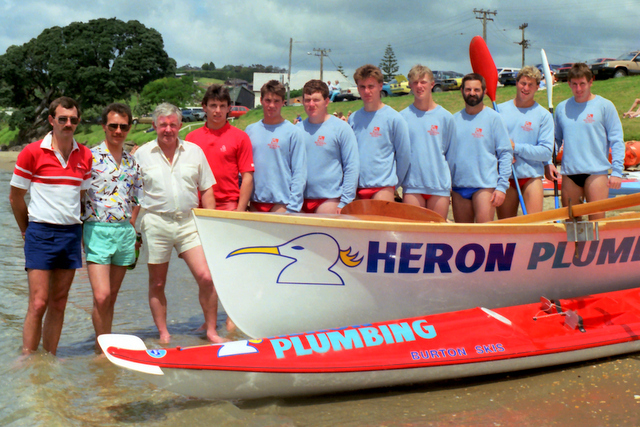 The Heron sponsorship of the Red Beach Surf Life Saving Club began in 1978 when Bryan Heron, through his company BH Heron Plumbers, presented two rescue training skis to the club’s Nipper members. In the years that followed, more support was provided by way of sponsored surf skis, boards, double skis and Nipper training boards. Full sponsorship and major support for the Red Beach Surf Club grew from there. The launch of Flying Herons 1 at Red Beach in February 1995. The launch of Flying Herons 2 at Red Beach in February 1999. This was the third boat to be sponsored by the Herons. Large donations were made to the clubhouse building projects, ranging from the roof for the new building to additions and alterations in later years. The very first Heron surf boat was handed over to the club in October 1988. Over time there have been no fewer than five new surf boats gifted to the club. Further financial support was provided through the funding of travel to surf lifesaving competition, support for travel to the sister club of Collaroy in Sydney and the funding of surf boat sweep training courses. Bryan Heron, in conjunction with club administrators, initiated the establishment of the BH Heron Red Beach Lifeguard Development Trust which will support the club’s lifeguards and surf lifesaving projects well into the future. 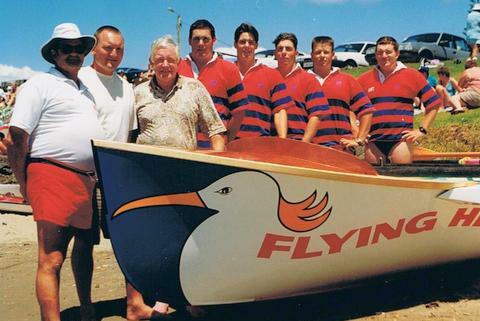 Bryan & Pat Heron are also the proud sponsors of The Flying Herons fleet of surf boats and they also generously sponsor the club’s surf canoe division. A major milestone was reached in November 2018 when 40 years of Heron sponsorship of the Red Beach Surf Life Saving Club were notched up. Footnote: Bryan Heron became Club Patron in 1996. He was recognised in the 2007 New Year Honours list and was made a member of the New Zealand Order of Merit (MNZM) for his community work with a wide variety of clubs and organisations, focussing on youth. He was made a Life Member of Red Beach Surf Life Saving Club in 2007. 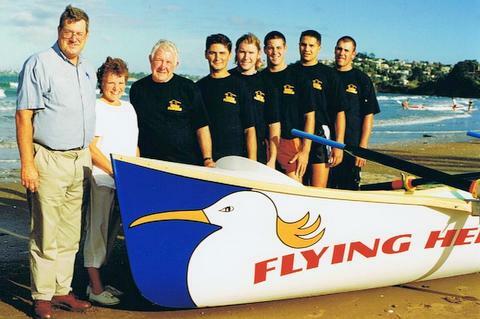 The launch of Flying Herons 3 at Red Beach in October 2002, the fourth boat to be sponsored by the Herons. 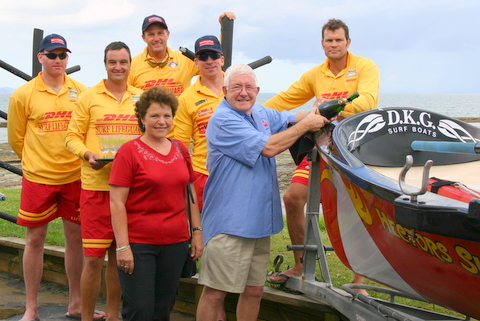 Hectors Surprise, the fifth boat to be sponsored by the Herons, was given a champagne launch at Red Beach in February 2005.